There’s something to be said for institutions that stand the test of time. Perhaps not the most important, but certainly worth noting is the traditional clothing store. If you live in a metropolitan area, you probably are familiar with one, maybe more. They have common characteristics: they tend to be individually owned, sometimes by a family; they carry ‘preppy’ or traditional American clothing, usually for men but sometimes for men and women; and they are often located adjacent to Old Money neighborhoods or shopping areas. The J. 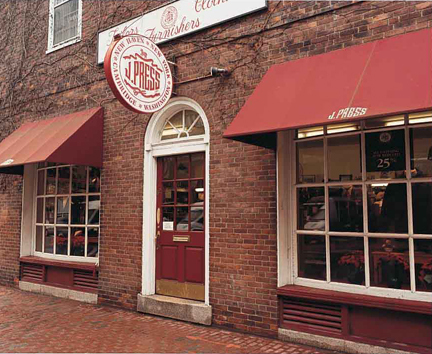 Press Store, Cambridge MA. Retail has gone online and many shopping malls are breathing their last breath. How does a brick and mortar clothing store survive, and even prosper? It’s not easy, that much is certain. But for a customer of a certain profile, there are important considerations. And traditional clothing stores haven’t forgotten or abandoned them. If you’re and Old Money Guy or Gal, you want, most of all, quality products at a fair price. I didn’t say ‘cheap.’ It’s been said forever and remains true today that you get what you pay for: it remains true for apparel, regardless of where it’s made or how good it looks on a company’s website. The true test of quality clothing is how it looks, feels, and wears a year, two years, or five years later. Most likely, you’re going to pay for that quality. But OMG’s will tell you in a heartbeat if something is too expensive, regardless of the quality. And they won’t buy it. Traditional clothing stores are keenly aware of this balancing act. They choose and price their goods accordingly. The style is not going out of style; the product is going to last; and it’s a good value over the long haul. OMG criteria: quality products at fair prices, with reliable customer service. Another consideration is the experience of doing business with someone you know. With traditional clothing stores who supply OMG’s, it’s often someone that your father or grandfather purchased clothes from. There’s a warmth and camaraderie that drifts into a room when a customer can discuss weddings, work, or whatever with the proprietor. This experience doesn’t exist online. You won’t find it very often at a huge department store. You’ll have to take the time to locate your place, develop a relationship with the staff over time, and then enjoy the relationship that takes shape gradually. This philosophy of buying from someone you know is the antithesis of globalization. It’s not a free market concept as much as it’s a local market concept. When you meet face to face and do business with a person you know, or can come to know, you preserve a part of humanity. You short-circuit technology and its distancing properties. You engage on a personal level. Cable Car Clothiers, San Francisco. Equally important, you support the people who work there. You thumb your nose at huge corporations who farm out their labor to factories overseas who, in turn, pay near-slave wages to workers in abusive conditions, and then pay celebrities ridiculous amounts of money to promote their goods. I’ve howled against sweatshops in previous posts, and we can’t all be moral policemen as we shop, but we can make economic choices that benefit our neighbors and our communities. That is to say, buy local and buy quality. There’s a comfort that comes with being able to walk back into the place that you bought something and reasonable address any issues you had with the product. Customers will pay a premium for that sense of fairness. Local brick and mortar stores tend to have generous return, refund, and exchange policies. They also tend to have decision-makers in management or ownership on the premises: if you have a problem with a product, you can frequently speak to the owner of the store immediately to get it resolved. 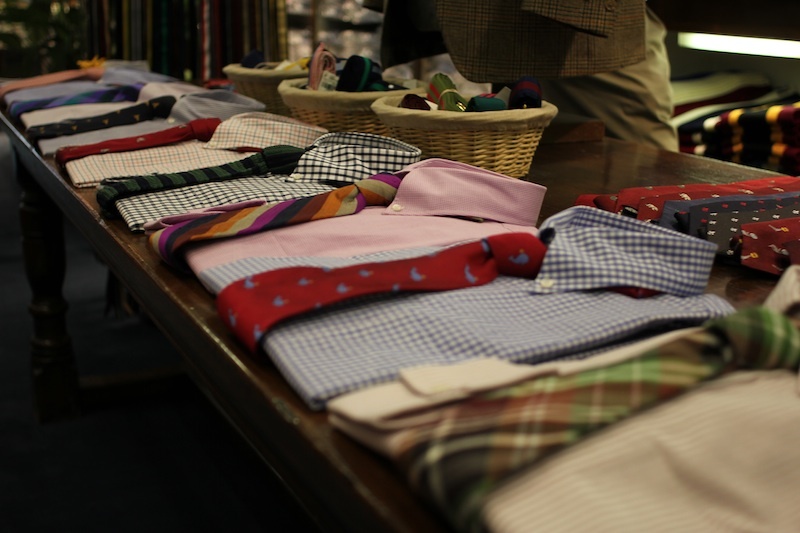 Of course, there are exceptions to every rule: Mercer and Sons shirts, Bill’s Khakis, Allen Edmonds shoes, all these quality vendors can be patronized without visiting a store. But overall, we often get the best products, at the best prices, and the best experience, when we buy traditional-styled clothing from a locally owned and operated store. Please let me know your recommendations. Who do you purchase your quality clothing from in your area? Points are very well made. We cannot expect a change from globalization and abusive sweat-shop practices if we partake in them on the demand side. I believe that supply follows demand wherever it goes, like Mary’s little lamb. Let’s change our demand to quality local clothiers as much as possible. 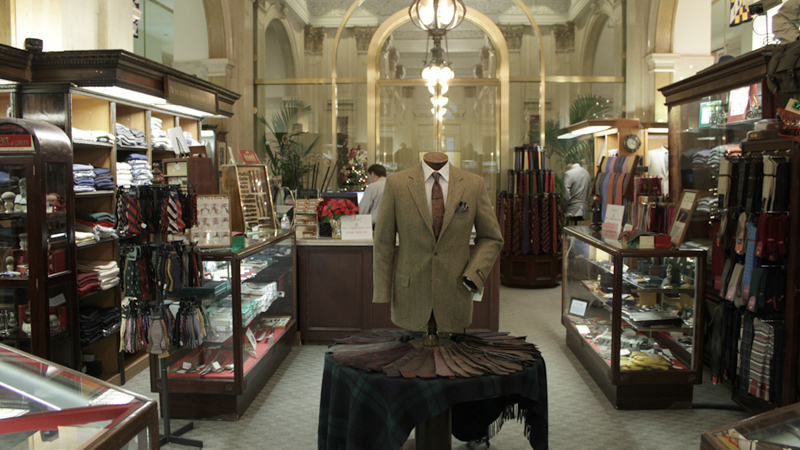 I have a local clothier as well as Allen Edmunds, Brooks Brothers, and a few lesser known brands to me. I go to Brooks Brothers often. I will make more of an effort to purchase from the smaller establishments. Brooks Brothers, Barbour, Patagonia, North Face, Filson, Lacoste, various surf shops, online. Nothing beats a local, skilled seamstress or tailor, particularly if you are not a “standard” size. I live in Idaho and the only proper men’s store (located in the only mall in town) closed in the mid-90’s as trends had changed so much there was little business for them. I buy from BB, LE, LLB, Orvis and, occasionally, Costco. All online. There is still a decent traditional men’s store in Boise but I haven’t purchased from them as they’re a couple hours drive. – camel Joop men’s wool coat. $64 + s/h. Again, looks like new just without tags. Buying these 3 items new would set me back over $1,200 in luxury retail stores. Going for second hand, I paid about 20% of the new price, that’s just crazy. At the same time, no extra resources (animals) have to be used just so I get a couple more clothes. Its basically recycling things people already have hanging in their wardrobes for years and grew out of or no longer like. I like that idea. Yes it takes lots of time to search & bid, but that’s part of the fun. Yes, judicious thrifting can be a great way to pick up items that are now hard to find new or crazy expensive. I’ve had the best luck with ties but, occasionally, sports coats and shirts. HI Byron: I really miss the small, independent stores. They’re out there, but everything seems to be done online now. I’m willing to pay for quality and service (within reason, of course). For my lifestyle now, which is casual, I shop at Orvis, they have a beautiful store in Manchester, VT. We’ll also head up to LLBean in Maine for long weekends, but their quality isn’t what it used to be. But I do agree with others’ comments here, and I think one needs to consider their lifestyle. I no longer work in an office so have no need for that line of clothing. Nor does my husband. Still love it, but I don’t wear it anymore. I like quality boots and leather products (Dubarry, Frye). Barbour is wonderful for my current lifestyle and I wear that. I do, however, miss the shopping experience at small stores and would drive a country mile to have it. I won’t miss the malls at all. Ditto, Janet. My seamstress grandmother taught me at an early age to recognize and make good, quality clothing. I now honor her memory by making the same for myself and others as a dressmaker. The best compliment I receive is someone saying ‘You MADE that?’ or someone coming in years later still wearing my garment and asking for alterations. Find a quality dressmaker who can both make clothing AND do alterations (some can’t or don’t want to do both.) You will save a lot of money in the long run and have clothing that will last for many years. I envy your clients. I’m afraid sewing is becoming a lost art in the United States. A titch late to this conversation, but, for what it is worth, here are our choices on southern Vancouver Island, British Columbia, Canada. First there is W&J Wilson, main store in Downtown Victoria and a second store in Oak Bay, Victoria’s largest British neighbourhood with lots of ex-pats. W&J Wilson has been here forever, still going strong and is chock a block with Burberry, Barbour, etc. They are the mother ship. There is also a small shop called Simply the Best with lots of nice shirts and items from the U.K. On the main street/high street of Victoria there is an Irish shop with clothing and a Scottish shop with clothing. Lots of Harris tweed jackets. Harris tweed jackets, which sell well here with our rainy climate, are dear in price and those that wear them, wear them forever. I proudly wear by father’s old Harris jackets. I also have my grandfather’s old Harris outer coat, rather like a short mac. He brought it over from Scotland to Canada in the 1920’s.That one is strictly for fall and early spring garden work as the moths have used bits and bobs for snacks over the decades. Still, one cannot throw it out. I live further up island near a small village called Cobble Hill. The Anglican church has a large annual jumble sale and wise shoppers can pick up a Harris tweed jacket there sometimes for $10 or so. New one here go for about $500 CDN is the Victoria shops. Great post, Byron. Do you have any experience with Alden shoes? In my opinion they are a solid notch up from Allen Edmonds. Very well made shoe. For winter months I like older US Navy issued pea coats. Heavy wool, very warm and can be bought for pennies on the dollar of what you’d pay for something new of a similar quality. Anything made in China I try to avoid. Unfortunately, all too many once respectable American companies have sold their souls and made the switch. Thanks, Alex. I don’t own any Alden shoes, but I’ve only heard good things about them. I wear a size 14, so I can’t just walk in to a store and buy anything on the shelf. I purchased my first pair of AE’s about 20 years ago and they wore very well. (They’re somewhere in storage now, I think.) Once I found the size and style I liked with AE’s (and they carry almost all their styles in my size), I never went further afield, especially with the convenience of their website. It’s one of the few times I conceded to the convenience of technology. Twenty years is a long time! Can’t have any complaints with those. I seen you have a number of pictures of nice shoes on your blog, but my eyes always go past them to the rugs haha. I have a slight obsession with Oriental rugs, they’re so beautiful. I don’t buy them at rugs shops though, love to go to thrift stores and estate sales looking for them. A big part of that for me is the thrill of the hunt. That’s funny. But, yes, always the old rugs, and when you inherit or acquire another, just stack it on top of the other one if there’s no more bare floors in the house.